The city of Eureka received an exclusive award Tuesday night, accepting the official Stoplight Plaque from the Willits Mayor Bruce Burton. Burton, who visited the city council meeting along with Willits City Manager Adrienne Moore, said the plaque had been in Willits' possession for more than 20 years. A 1971 map detailing some proposed reroutes of Highway 101. "Since 1994 the city of Willits has been known as the first stoplight north of San Francisco," he said. 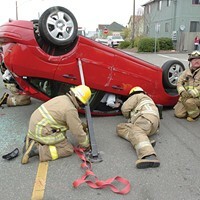 "Cloverdale held it for some 20 odd years, since 1962 when they bypassed Santa Rosa and Healdsburg. In '94 Cloverdale brought this little plaque to us. Now it's time to pass it on to you." Willits lost its distinction as the last stoplight on U.S. Highway 101 north of San Francisco on Nov. 4, when a new bypass opened, releasing a bottleneck in the major thoroughfare and, according to Burton, "giving us our town back." Burton presented the plaque with its miniature stoplight to Mayor Frank Jager and suggested he use it to control public comment. "I think you may end up holding it for longer than anyone else," he said. Burton is probably right. The last time there were any major studies into a realigning the highway was in 1971. The proposed line wouldn't have bypassed the city entirely, but instead would cut toward the coast and through what is now Old Town. 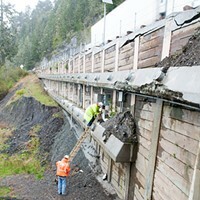 "Potential impacts to the community, a state funding shortfall, an oil embargo, fuel shortages and a lowered priority led to the project being scrapped," said Myles Cochrane, public information officer for Caltrans. "Assuming Caltrans ever has enough funding to invest in a Eureka bypass in the future, the city would have to convince us there is community support — most notably from the businesses and residents that would be impacted. 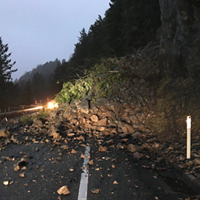 And then there are the environmental impacts to consider," he added, saying that top priorities for Caltrans right now for Eureka are improvement projects along the existing infrastructure. The original alignment proposed by Caltrans, through the Palco Marsh, would likely never fly with the Coastal Commission. 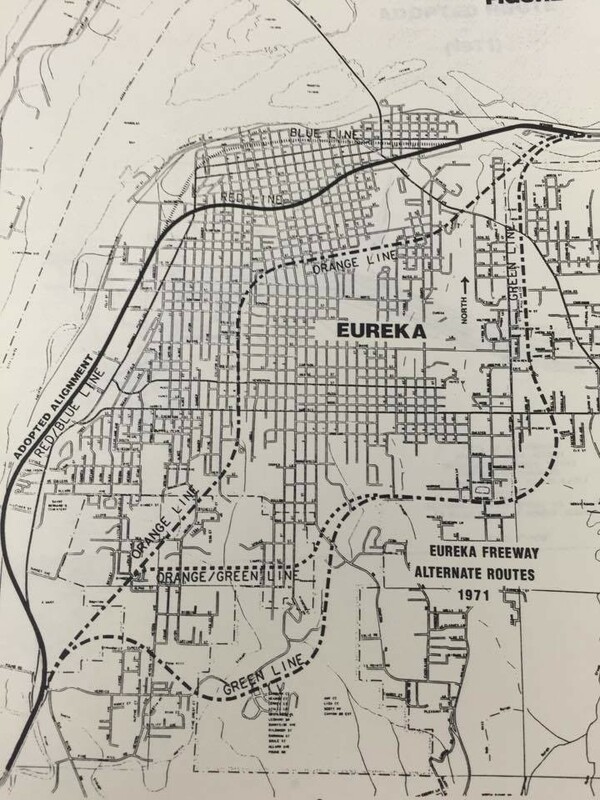 On the 1971 map with a several suggested routes, the only one that would actually technically bypass Eureka appears to cut through Cutten. It's hard to picture anyone being cool with that, so, sorry, Crescent City, I think we'll be retaining that little plaque for quite some time. The council also discussed a temporary moratorium on non-medical cannabis proposed by City Attorney Cyndy Day-Wilson, an urgency ordinance that would halt the production, sale and distribution of the substance for recreational use while city staff reviewed its options under the new Adult Use of Marijuana Act (Proposition 64), which California voters passed Nov. 8. Discussion of the urgency ordinance divided the council into two camps, with Natalie Arroyo and Linda Atkins contending that, because business licenses under the AUMA will not actually be available for another 13 months, the city had plenty of time to fine tune its regulations. Melinda Ciarabellini and Marian Brady erred on the side of caution. "If nothing’s going to happen until 2018, what’s the problem with an urgency ordinance?" asked Brady. Both Day-Wilson and Rob Holmlund, the city's development director, said there was a chance that an existing business owner could add a recreational cannabis product, such as pot brownies, to their existing business without applying for a state license, doing an end-run around the laws. Arroyo countered that it was currently possible to order marijuana brownies over the internet, and that it was important to bring people in the marijuana industry "into the light." Council member Kim Bergel acknowledged the input of city staff, adding that a temporary moratorium would have to remain temporary. She joined Ciarabellini and Brady in voting to adopt the urgency ordinance, but because the motion required a four-fifths supermajority vote, it did not pass.